The following is a guest post, written by my husband, Stephen Hannington. I have been a keen bird watcher since I was six years old when a cousin introduced me to the world of birds. In the past fifty years I have assembled a considerable life list of most of the bird species of North America (ABA listed). However, there are still a few species which have eluded me despite my fervent efforts to find them in their natural habitat. Of the fifty-two Wood Warblers found in the U.S. (not including vagrants from Mexico) I have seen 49. That is until last Sunday, November 8th when I finally found warbler species number 50—the Swainson’s Warbler (limnothlypis swainsonii) named by John James Audubon after the influential 19th century naturalist William Swainson. My other remaining unseen warblers are the rare Colima Warbler found only in the Chisos Mountains of west Texas and the uncommon Olive Warbler restricted in the U.S. to southeast Arizona. Quite unlike the living jewels so typical of the Wood Warbler family such as the breath-taking Blackburnian Warble, which “burns” bright orange deep in the boreal forest of Canada or the striking Painted Redstart found fanning its gorgeous tail feathers in the “Sky Islands” of southern Arizona, the rare Swainson’s Warbler is a rather drab, brownish, unassuming bird. A furtive skulker of thick undergrowth by nature the Swanson’s Warbler lurks in swampy regions of the south-eastern states of the U.S. in the summer and in Central America in winter. For years I have searched in vain for this elusive bird on its breeding grounds in Texas, Arkansas, Louisiana, Mississippi and Tennessee as well on its wintering grounds in Mexico and Belize. All to no avail until last Sunday while on a birding trip to South Padre Island. Sunday was our last day of birding with the 2015 Rio Grande Valley Birding Festival. Lisa and I got up very early that Sunday morning and I could already tell, even in the black of night, that it might be a challenging day with the weather. We met our van and the small group of birders going to South Padre Island to take a bird watching boat tour around the salt marshes and tidal flats of Laguna Madre. We were hoping to see thousands of migrating shorebirds, gulls and terns as well as the abundant waders such as Reddish Egrets and Roseate Spoonbills. However, the weather still was not cooperating with its rain and wind. After an hour’s drive from Harlingen to South Padre Island where we were to board the boat taking us out to Laguna Madre the rainy weather worsened steadily and the wind was picking up. The group leader instead took us to the South Padre Island Birding and Nature Center–a designated World Birding Center–where we would wait for the weather to improve. While we were waiting Lisa and I walked a trail that wound through some scrubby areas and a salt marsh near the Nature Center. We did see some nice birds along the boardwalk over the salt marsh, including a close up look at a Tricolor Heron that we inadvertently startled as we walked on the boardwalk right over where he was sheltering himself. A great look, indeed, but unfortunately the bird did not stay put long enough for photos. There was also an Osprey flying overhead with a fish it had just caught and that’s always exciting, but the rain and wind just weren’t going to let up and so our birding for the day was going to be limited. We saw the group gathering near the van so we figured it was time to return and find out what the plan was going to be. 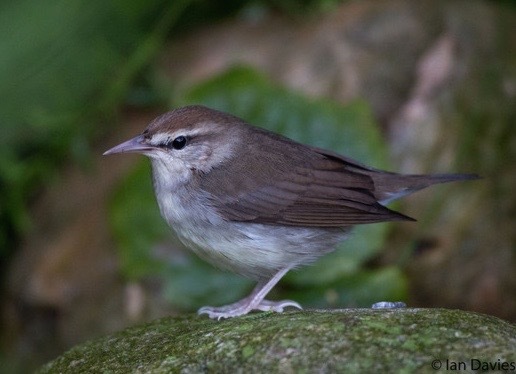 Then I heard someone say with both excitement and a hushed tone: “SWAINSON’S WARBLER!” We all quickly jumped into action and with binoculars, scopes, and big telephoto-lens cameras scoured the small grove of bushes where this bird was first seen. I looked through my binoculars and could not find the bird. “You got it?” I anxiously asked another birder standing nearby. “It went into the bushes on the left” he replied. I still could not spot it. “It just flew down low in the bushes on the right!” another birder exclaimed, again in a hushed but forceful whisper. “Where? Where is the warbler?” I asked again. “Fifteen feet to the left of the willow tree in the shadows, in the leaf litter,” yet another birder precisely pin-pointed. “Ahhh! there it is now! I got it now!” I did, but just for a split second. I got a fleeting glimpse of the Swainson’s Warbler before it flew into an impenetrable tangle of prickly bushes and vines. But it was just a blur. I didn’t get the good look I needed, but I was going to live with it. I squatted down low trying to get a better view but all I could see was the flitting image of a small, drab brown bird. It could have been any bird from what I could see. Our group tried to follow this furtive warbler as it non-chalantly moved through the thick bush feeding on insects, spiders and other small critters it found in the leaf litter. This went on for half an hour and all I could get was a fleeting glimpse of the bird but I was elated. After all these many years of searching I finally saw my first Swainson’s Warbler. I did not get a very good view of the bird but it was a lifer for me and I was giddy with excitement. I fist-bumped Lisa—our little ritual whenever we get a lifer. There is a special feeling of elation and excitement birders get when spotting a new bird species for the first time in their life. I call this feeling “Lifer Ecstasy.” I was happy and it didn’t matter if it was rainy and windy and we wouldn’t be going on our planned boat birding tour. I saw my first Swainson’s Warbler (albeit just a brief glimpse) and this little victory more than compensated not going birding on Laguna Madre. Sitting on a park bench and munching granola bars my wife and I were discussing how frustrating it was not to get a good look of this lifer. It reminded me of when I stood in the rain for an hour in the Andean highlands of Ecuador trying to spot the rare Paramo Tapaculo, a similar small, drab brown bird that is more often heard than seen because it prefers to remain hidden from view. It was precisely at this point while discussing our frustration over the situation that a volunteer at the center who was sitting beside us pointed her finger and said “There, on the tree stump, there it is!” And there, out in the open, there was our Swanson’s Warbler! It stayed out in the open for all to see as it hopped around from stump to large rocks to a thick tree branch as it turned around to give us views from all sides. Saying it’s a breath taking moment isn’t a cliché. To stand there and look through your binoculars at something you’ve chased for 50 years, you can’t help but hold your breath. I’m surprised more birders don’t pass out in the field. Sadly and somewhat ironically we found out shortly after we had left South Padre Island that our wondrous lifer’s life was to be short. News that it was caught and eaten by a Loggerhead Shrike (another uncommon bird which has suffered a drastic population loss in recent years) spread fast, both at the festival and on Twitter. I was saddened at the untimely loss of our little lifer who had thrilled us so much. Why couldn’t that Loggerhead Shrike catch one of the many House Sparrows hanging around the Nature Center instead? Well, that is just nature’s way I try to tell myself. Birding would not be birding if it didn’t have its moments of both ecstasy and irony. Warning: Video contains all my dreams being torn apart and devoured by a Loggerhead Shrike. Video published on Nov 8, 2015 on YouTube by Mira F.
Great story, thanks for sharing!!! Getting lifers are indeed amazing, especially after such a long wait. Thank you, Pierre. Finding lifers makes the chase all worth it. I too am trying to nail down all the warblers, only I started late, only a couple of years ago. I have a long way to go, but being in several flyways for migration will help me check them off more quickly than 50 years, I hope. Cheers! Glad you and the wife had such a fabulous trip down south. We’re certain you’ll find all those warblers. And about that Shrike…yes, we loved seeing the Loggerhead Shrike multiple times throughout the Rio Grande Valley Birding Festival and got excited every time. Glad we weren’t there in person to see the one in that video chew up the poor warbler. I like your question about why more birders don’t pass out in the field when they see birds they’ve been chasing and wishing to see for years – funny! And how tragic that the shrike ate the Swainson’s, – I too would have been saying, “Why not a nice, tasty little House Sparrow?” But it’s good to know the shrike is managing to get its meals. Couldn’t watch more than a few secs of that video though! Good birding to you both! I’m with you. I couldn’t bear to watch more than a few seconds of that video. I’ve never been able to come to grips with the whole food chain thing. I normally love finding Loggerhead Shrikes, but in this case? I could have passed.